The "triple d-light" means exactly what its name implies: concentrated lighting pleasure. For an added touch of elegance, use “triple d-light” for "accent lighting" and you soon realize how much the special features in a room, such as artwork, architectural details and furnishings have gained in significance. This type of light is commonly seen in art galleries and museums to give a life like quality to the display. The “triple d-light” lamp’s unique structure helps you position the light beams freely in space, creating a bright shaft of light that sets the encountered objects apart from their surroundings and brings out their “clandestine” colours for all to enjoy. The beam precision and the unidirectional nature of the generated white light are perfectly adapted at creating special moods and ambiences around your most valued objects. Retailers can also use "triple d-light" lighting in display windows to illuminate merchandise, attract attention, and even send a message about the quality of their store. For the prospective customer, it creates visual interest and makes the merchandise stand out from the background. As with all our production we have taken the eco-friendly and inclusive approach needed for today’s light sources. Incorporating the most advanced LED technology available “triple d-light” is designed for sustainability, minimal light pollution and high energy efficiency, effectively setting new standards. Its high-power LEDs have a very low electrical consumption, consuming merely 7.5W, providing a safe and affordable light over an operational lifespan of 50,000 hours, which correspond to 15-20 years when used daily. The “triple d-light” visual appeal and aesthetic elegance derive from its contrasting straight lines. The soft finishes of the metal components, the deep orange transparency and the satinated surfaces all contribute to a balanced mix of value, performance and style. The positive energy released by this beautiful luminaire combines precise detail enhancing performance with soft emotional results. The lamp's modern and rigorous structure, the warm hallo and the precise light beams find their natural place in any modern or trendy space, where it enriches the “charme”, creates “drama” and softens the atmosphere. It is nevertheless meant for "accent lighting". Solid state Lighting LED technology combined with pure structure, together with a tinge of fantasy, still positions "kissimu 3" in the avant-garde of high power LED designer lamps. In fact its conception and design dates back to 2007 when incorporating high-power LED solutions within a designer lamp was barely in its early infancy. “ kissimu 3" is a functional and eco-sustainable luminaire. Its photometrics define it as such; it provides around 700 lumen and has been studied to offer “natural daylight” at 6500 degree Kelvin with the adequate intensity for “ambiance” lighting. “kissimu 3” and its power LEDs have a estimated lifetime of 70.000 hours and as any quality Solid-State Lighting does not require maintenance. "kissimu 3" has a soft touch on/off electronic device at its base which allows only one, or both parts of the luminaire to be switched on. The "kissimu 3" table lamp goes beyond the pre-conceived idea of a table lamp. Its fluid design gives a sense of “taking off” and a feeling of lightness. It is true ambiance lighting abiding by a sustainable feng shui. "...I would like someone to design some truly innovative lights, because I believe that designing beautiful, functional and, above all, new lighting is the hardest thing to do." This is what Vivienne Westwood, the "grande dame"de la haute couture, once said after a recent exhibition in Milan.Surely the "kissimu 3"table lamp would meet this great fashion icon's whims. Innovative LED technology, pure structure and a dash of extravaganza, "kissimu 3"™ is avant-garde without transgression. 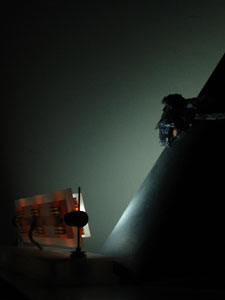 "kissimu 3" goes beyond the intrinsic "stability" associated with table lamps. The lamp's fluid and ironic design evokes more a "taking off". Exclusive but not elitist, "kissimu 3" is one of liki liki's limited edition LED luminaires.